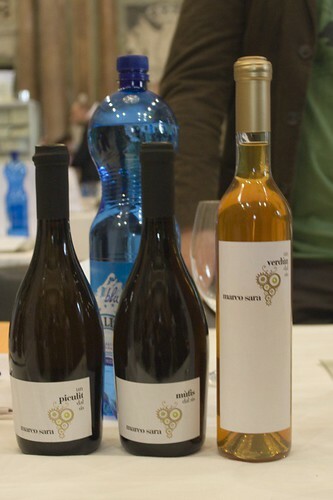 Marco Sara, a young wine maker from Friuli, one of the eastern region of Italy: he has just 3 acres and he make just 3 wines: Picolit, Mufis and Verduz! One better than the other! My husband, who is a sommelier and he’s acknowledged among our acquaintances as a fierce wine critic, after trying them, said: “Astonishing!” That was a first, I can tell you! Thanks to Filippo Ronco, who told us we should try them! Or like Emidio Pepe, a wine maker from Abruzzo, making bio-dynamic wines that will last for ever, like the astonishing Trebbiano d’Abbruzzo 2001 we were lucky enough to have at La rucola in Sirmione: a white that had no problem to cast all its flavors even over roasted lamb. 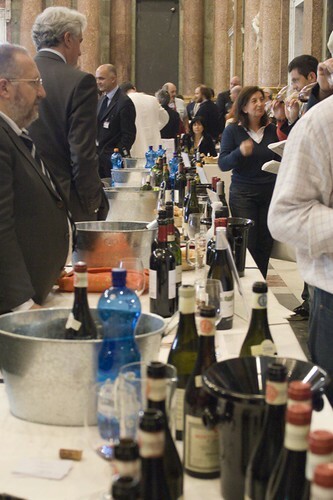 We had the pleasure and the honor to try those and many other wines at Terroir Vino, an interesting fair of wine producers mainly from Italy (but there were two French, and you could feel the different approach with communication: French are, astonishing enough, so nice when they come to wine speech!). 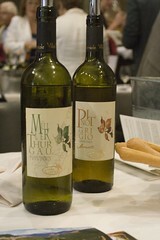 Forget Vinitaly and its Barnum circus: get back to basic! A desk, few bottles of wine, some pieces of Ligurian focaccia, and your glass: that will make your day and your tasting experience! grande presentazione per questo post! Buonissimo il Verduzzo e buonissimo il Picolit! Detto da una che ha parenti nella zona di produzione… Baci! Wow, so many bottles of wine! Different shapes, labels, types .. looks as if they had a bottle per person!